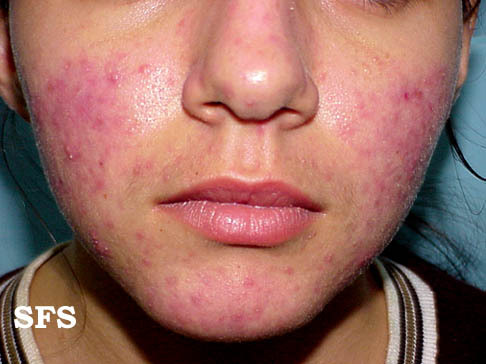 Rosacea is a skin condition marked by redness with plaques or papules (pimples) hence the term acne rosacea. However, rosacea should not be confused with acne vulgaris that is commonly seen in teens as it is a different condition altogether. In fact, rosacea is more common in middle aged adults compared to acne vulgaris in the teenage years. Although rosacea may occur in episodes where it flares up and then resolve significantly for a period of time, the condition is progressive meaning that it will get worse over time if left untreated. 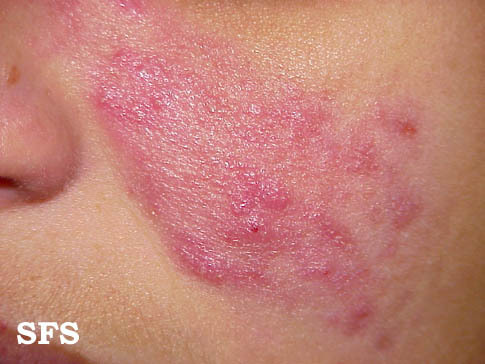 The condition is more common in fair-skinned people and Caucasians but a variant of rosacea known as acne agnimata is more commonly seen in Asians and Africans. The exact cause of rosacea is unknown despite certain triggers being common to most patients. The main features of rosacea is inflammation, abnormality of blood flow through the cutaneous (skin) blood vessels and overgrowth of tissue over time. Although the disease process behind rosacea is not well understood, several findings have suggested a possible cause for the redness and inflammation. This includes changes in the blood vessels of the skin, microbes and elevated levels of immune chemicals. The characteristic redness of the skin seen in rosacea is due to increased blood flow through the superficial blood vessels as well as an increase in the number of vessels at the affected area (increased vasculature). The sensitivity of rosacea sufferers to heat may also account for the increased blood flow on the surface of the skin. It is also postulated that the drainage of blood in the skin tissue through the veins is hampered and blood therefore pools at the site to some degree. Demodex mites may have some role to play in the development of rosacea. These mites have a predilection for human follicles. It may not be that the mite is pathogenic but rather an immune response to the presence of these mites initiates the inflammatory response. There is also some evidence that Helicobacter pylori (H.pylori), the stomach bacteria that causes gastritis, may also play some role in rosacea. Elevated levels of certain immune compounds and skin enzymes may be contributing factors to the disease process in rosacea. This includes chemicals such as cathelicidin and stratum corneum tryptic enzymes. Redness of the skin with a tendency to blush/flush easily . Tiny blood vessels that are visible on the skin surface (telangiectasia). 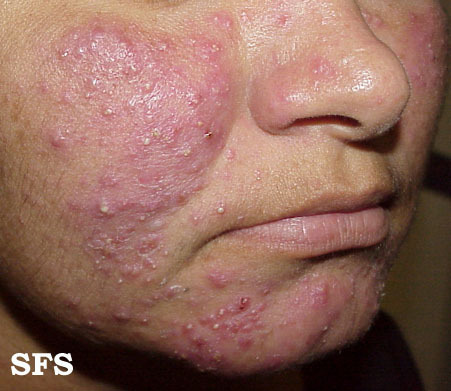 Raised bumps (plaques) and pimples (papules). Red swollen nose due to overgrowth of the soft tissue of the nose (rhinophyma). Very light skinned people do have tendency to flush or blush easily which is not necessarily due to rosacea. This is more evident on the cheeks and is known as malar flushing. Similarly many other skin diseases may cause redness of the skin due to inflammation and this as well should not be confused with rosacea. Easily triggered by sun exposure, emotions, hot or cold, alcohol, spicy foods and cosmetics. 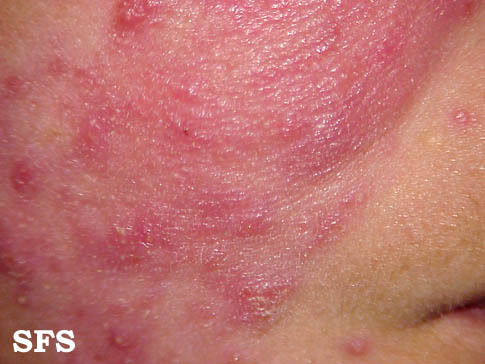 The features of the pre-rosacea phase persists even as the condition progresses to other phases. Facial redness with swelling (edema) on the affected sites. Small blood vessels on the nose and cheeks become visible. Oily skin and dry flaky skin may appear on the affected area. Small papules and plaques develop. Condition can ease or worsen on its own without any triggers. Skin on the cheeks and nose thickens and becomes rough. Condition becomes unstable and peristent. There are no longer periods where the redness eases almost completely. Rosacea pictures from Dermatology Atlas Brazil courtesy of Samuel Freire da Silva, M.D. There is no definitive cure for rosacea. Treatment with medication at most limits the severity of the condition and reduce the symptoms for a short period of time. The treatment measures are similar to that of acne vulgaris. It includes medication primarily with surgical measures for the visible blood vessels on the skin surface (telangiectasia) and rhinophyma. Foods and drinks such as spicy foods, alcoholic drinks, caffeinated beverages. Sunlight by the use of sunscreen. Cosmetics and other skin care products that cause irritation. 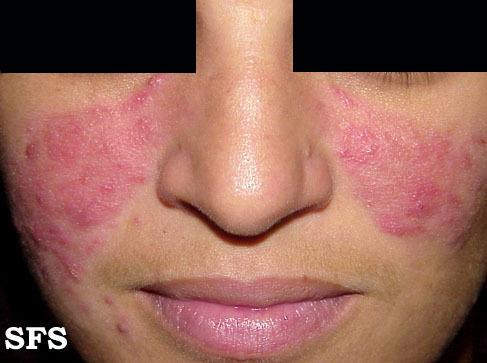 Corticosteroids should only be used for a condition known as rosacea fulminans (pyoderma faciale) which resembles severe rosacea. Surgical measures are also not curative but can help reduce the cosmetic impact and improve some of the symptoms of rosacea. Telangiectasia – electrosurgery or pulsed laser. Rhinophyma – dermabrasion, laser peel or surgical shave procedures.